If you are a professional singer or public speaker and you are pregnant, you have to prepare for the many side effects of pregnancy. For you, the most challenging may not be morning sickness or exhaustion, but the effects of pregnancy on the voice. There’s much we can physically overcome when we are “on”: on stage, teaching, or presenting. However, when your primarily tool is compromised for over nine months of work, you have to strategize and do all you can to limit the ills. It’s not all bad news and you have some control over the extent of it by adhering to the rules of vocal health and some simple singing tips. I just gave birth to my third child a few weeks ago and this is my third pregnancy that I’ve sung through for a living — up until the day I gave birth for all three. As a vocal coach and performing singer/songwriter, I have to use my voice constantly both for speech and for singing. With proper voice care, I have had little negative impact on my vocal cords until approximately 32 weeks, or seven and a half months. In fact, during the second trimester, my voice felt very clear. Perhaps doing things right for baby assisted in doing things right for vocal health: lots of water, little to no caffeine, no alcohol, more rest, no greasy or acidic foods, steam to treat allergies in lieu of medication — my voice never felt better. Ruth Gerson — “A Song A Week Til Birth” — 36 Weeks Pregnant. It changes for me right around the time my hands and feet begin to swell. When edema begins, it’s not just your extremities that balloon. The increase in progesterone and estrogen and the decrease in circulation caused by where the baby is sitting leads to swelling in the vocal cords as well as the legs, hands and feet. When the baby begins rapid and awe-inspiring growth in the third trimester, lung capacity is compromised and breathing for singing becomes much more challenging. 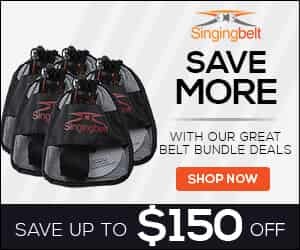 (My work particularly focusses on singing and breathing as I created the Singingbelt, so maintaining breath control during the last 8-12 weeks of pregnancy is particularly important for my job.) Swollen vocal cords and intermittent labored breathing are part of pregnancy and particularly challenging for the professional singer or public speaker. If you plan for it, actively train your voice, and work on your breathing, you should be able to work fairly close until your due date, if not until your water breaks — provided you are having a healthy pregnancy in general. You have to think of yourself as an athlete: Everything you do to care for the voice, will help you through pregnancy and make getting back to the top of your game easier after the baby is born. Rest: Get all the rest you can when you can get it. Get strict about bedtime. Cardiovascular exercise: Circulation. It will help exhaustion and morning sickness. Later in your pregnancy, it will keep swelling in check. Breathing exercises: If you don’t already have breathing exercises in your daily vocal warm-up routine, begin them now. You may start to have some shortness of breath even in your first trimester. The more you work on your breathing now, the more it will pay off later, when you really need it. Cold compress: Try cold water on your face and wrists to treat fatigue. It takes a minute, it refreshes for an hour. Steam: For post-nasal drip, or congestion, boil water, pour it in a bowl, take a towel and make a tent over your head and the bowl, seal it up, tucking the towel in and breathe deeply from the nose and mouth. Do it first thing in the morning, if you can in the afternoon and before you go to sleep. This is also helps with allergies. If you have pets, and they usually sleep in your bedroom, try them in another room. Keep your bedroom dust and mold-free. Motion sickness wristbands: Motion sickness wristbands can take the edge off morning sickness. Ice chips: Generally, ice cubes aren’t for singers, but they’re good for nausea. Let them melt, don’t chew. Spearmint: Mint is also not always best for singers. Mint and menthol can be irritating to the vocal cords, but spearmint is not bad, and soothing on the stomach. Vocal exercises every day: When you’re exhausted, sometimes you get lax. It’s important, if you are a professional singer or public speaker to stay on top of your vocal technique. You’re going to need daily practice to keep up with the incremental changes that are occurring in your body. Even if you have to do a little less, keep vocal warm-ups in your schedule. After you have the baby, you may not be able to practice for a couple of weeks, or more, so do it while you can. The second trimester: This is supposed to be the good one, but it’s not always blissful. Exercise: Keep it up, but don’t over do it. Circulation is your best friend, and a little strength training will help your body prepare to carry extra weight. Your hormones are changing the way your ligaments and muscles respond. To avoid painful muscle spasms, watch your posture and use less weight. Healthy diet: You are not eating for two. Your baby needs an extra 300 calories a day in the second trimester, and 450 in the third, according to BabyCenter.. Hunger can kick in hard in the second trimester, and if you overeat or eat unhealthy food, you can affect the voice by gaining weight too rapidly and by causing acid reflux, leading to hoarseness and laryngitis. I know how it feels, “I’m big anyway, I’m gonna have a milkshake and fries.” Try to eat normally and make the extra calories you need healthy ones. OK, a few milkshakes are not going to do any damage, but a milkshake every day will not help you sing better. Don’t eat directly before singing. This is a rule of thumb for all singers, but in the case of the pregnant professional singer or public speaker, don’t bend it. 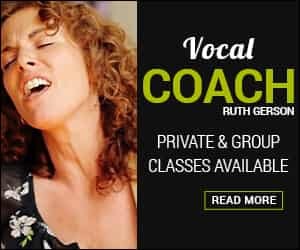 Voice training: It’s very important now that you keep up your vocal warm-ups and breathing technique on a daily basis. You may start relying more now on your back muscles (erectors and lats, as well as your intercostals) for breath support, and less on your abdominal wall muscles than you have in the past, to control your diaphragm and support your voice. Exercise and drinking water are the most effective remedies I know for swelling when you’re pregnant. The difference for me was soccer balls for feet, baseball mitts for hands. That’s how missing one day cardio can be when you’re pregnant. You notice swelling mostly in your extremities, but it’s happening all over, and you can hear it in your singing and when you speak. Don’t push your voice when your vocal cords are swollen. Don’t force or strain your voice, and try to muscle through. When the vocal cords are not moving properly due to swelling, singers will feel the need to use more air pressure, which pushes the vocal cords apart, slamming them into each other with much more force. Make accommodations for your changing body. You won’t be pregnant forever. If you’re performing, take it into account in your repertoire. If you’re teaching, or presenting, get creative about what you can show instead of say. Use a microphone and pay attention to your mic technique. When you get excited, don’t scream into the mic. You can emphasize points by changing your pitch, instead of increasing your volume. Refrain from talking over people who are talking. Ring a bell, clap your hands, smile and wait until people listen, have yourself introduced. Instead of talking and answering questions after your performance or presentation, pass out your card and answer questions by email, post it on your blog, so you can refer to the same answers. Be a good listener. Save you voice. Relax and be patient: Stress and emotion affect the voice during pregnancy. Some of us might be more emotional, especially as we become more uncomfortable. That’s normal. Take a breath and remind yourself that heightened emotions are part of the side effects of hormones during pregnancy, and you can choose how to respond. Stress, tension, crying, and yelling are not good for your voice. Take a walk. Take a shower. Take a nap. Read a book. Write a song. Disengage from emotional situations, and remind yourself you can usually deal with a large percentage of them when you are calm. When you’re beautiful, beautiful, miraculous child is born, you will probably look back and laugh at yourself for stressing over what was happening to your voice and what jobs you were able to do, and not able to do. It’s not that those things weren’t important, it’s just the realization that having a healthy baby is so much more important, that it puts all of life into perspective. As your swelling decreases, and your body begins its journey back to normal, your voice will start feeling more familiar again. The first few weeks after you give birth, you will need to take it as easy as you can, you will need to rest and heal and if you’ve had a C-section, it will be a bit longer. This is the time you will probably not be able to do your daily practice and you may have at least a few nights of no sleep. Sleep deprivation is hard on the voice. Give yourself at least a couple of weeks before you start presenting or teaching, and to be on the safe side, at least six weeks before you start performing. Make sure you’ve had a few weeks to practice and feel strong before you sing on stage. If you are performing and you’re not at 100 percent remember sometimes a limitation in a voice can be what distinguishes it. Adjusting for some limitations in range may force you to improvise and sing something spontaneously different from the way you have in the past. It can freshen your performance. The highest note, the loudest or longest is impressive, but the note that’s really tied to your thought and your emotion is the most powerful. Sometimes when we can’t depend on vocal acrobatics, we focus on what’s most important — what we’re communicating. A side effect of pregnancy may be the creation of a richer performer.